If you’ve been working on a Windows project, maybe in a team for some time, chances are that the output executable has become pretty sizeable. This is not always the case, but many a vintage project has a history of growing and growing. With current hardware, storage sizes and prices and so on, many have no interest in the size of their executables and that’s absolutely terrific. Some, though, are always looking for an opportunity to get an easy win with regard to file sizes and application footprint.footprint. If you are of the former mindset then I bid you a good day; there is likely nothing more for you here. If, however, you fall into the latter camp then please read on for a nice hint or two (or a reminder for some who saw this notion some long time ago). There’s a trivial way of getting a reduction in executable file size for your applications just waiting to be employed in both Delphi and C++Builder, including the (currently, at the time of writing) latest release of Delphi 10 Seattle, C++Builder 10 Seattle (or RAD Studio 10 Seattle, which contains them both). You are probably well aware of (even if not a regular user of) the Image Base linker option. This value defaults to 400000 for all Delphi and C++Builder projects and many of us never change it. Note this is a hexadecimal value, so is actually $400000 or 0x400000. It relates to the address that the executable file has embedded into it, telling Windows at which address to load your PE (Portable Executable file format) file into memory. Often times when DLLs get loaded, there is already something at their specified base address or near it, which would cause an overlap, so Windows has to then move the image to a free space in memory. 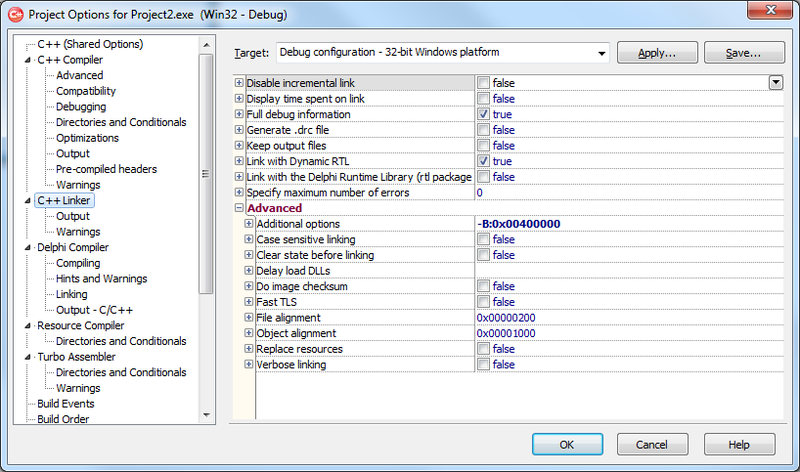 Windows is able to perform this relocation by using a relocation table, which is also found in the PE file. The thing is, though, while DLLs can be loaded hither and thither around the address space an application will always* be loaded at address 0x400000. Because of this fact the relocation table is, strictly speaking, unnecessary in a .exe file. The bigger the executable file the bigger the relocation table will be, often between 5% and 15% of the total .exe size. * To be clear, in his March 1994 MSJ article, Peering Inside the PE: A Tour of the Win32 Portable Executable File Format, Matt Pietrek (previously of Borland) does claim there could be a risk if you ran an executable without a relocation table on another Win32 implementation that didn't use 0x400000 as its base address, but given that all the current supported Microsoft Win32 implementations do, it shouldn't be an issue. This is rather backed up by Visual Studio 2015 defaulting to stripping out the relocation table, as per this documentation page on Visual C++'s /FIXED linker command. Once upon a day enterprising individuals could remove this relocation table by resorting to dedicated tools, such as StripReloc. But those days are long gone: given the appropriate enticement both Delphi and C++Builder will remove the relocation table for you. Yay! We just need to be careful to only do this for projects that generate .exe files. Anything else that is generating a .dll or equivalent (.cpl, .ocx, etc.) definitely definitely requires its relocation table. So what is the trick, for those of us who want to avail ourselves of it? Well, let’s look at Delphi first. This sets a PE file header characteristics flag telling Windows there is no relocation table. 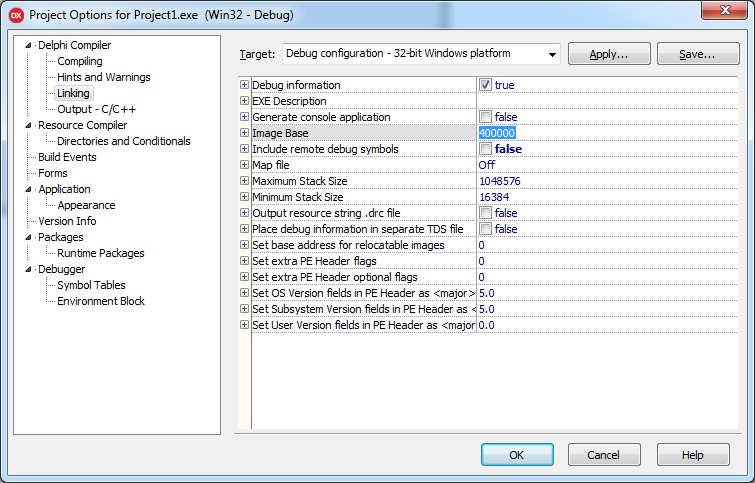 In addition, Delphi takes the hint and ensures that no relocation table is placed in the PE file. Easy! Now what about C++Builder? Well, according to the documentation on ILINK, the –B switch lets you specify the base address and request the relocation table is removed so we just need to ensure we get that option passed along to the linker. This documentation page on advanced linker options says we can pass command-line switches along to ILINK with the Additional Options setting. So in your project option options on the advanced linker options page, set the Additional Options setting to -B:0x00400000 and there you have it. It has been noted online by David Heffernan that if your application is not actively using RTTI, then you can throw out another chunk of your executable file by minimising the RTTI stored therein. Just be warned, this isn't as sure-fire a success as the relocation table removal. Back in this tip-laden blog post I talked about another option you can enable using a PE file header characteristics flag, which tells Windows that when run from a network share, the executable should be copied into the local paging file and run from there, a feature which does not affect any programmatic reference to the executable file location (so Application.ExeName works unaffected and .ini files located by the .exe file will run as expected). This tip improves the user experience if there are glitches in network connectivity. You can specify other PE file header characteristics flags using the Image flags option on the C++ Linker, Output section of the project options according to this page of the documentation. It's pretty trivial to get between 5% and 15% size reduction on a regular Windows executable file, with no notable drawbacks [Update 20160105: other than disabling ASLR, if requested, in the case of Delphi projects]. 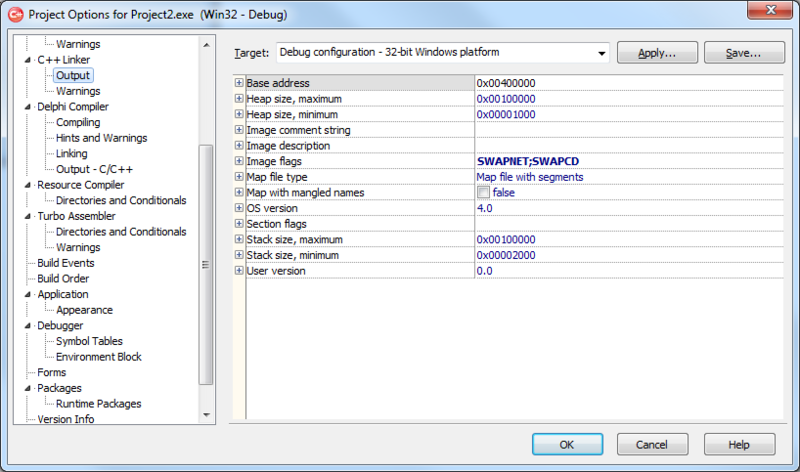 Thanks go to the inimitable Hallvard Vassbotn for his near-decade old post that introduced me to this Delphi feature, which this post is intended to re-broadcast to the current spate of Delphi and C++Builder programmers. Also thanks to David Heffernan for his comments on Stack Overflow and to Maël Hörz for his follow-up.